It is never acceptable for a toddler to bite or hit another child. A stay-at-home dad must stress that these are unacceptable forms of behaviour and should always treat them as such. It may shock parents to see their child resort to violence, but most of the time the toddler is simply venting frustration. If a toddler wants a toy that another child is playing with, he may use violence to get it. It is important to understand that the child is not being malicious or aggressive deliberately. After all, he is too young to know how his actions can affect others. Unfortunately, this means it can be some time before the child is able to understand that biting and hitting hurt. Even being on the receiving end is not always enough to get the message across, but this does not mean the child will become a delinquent. In all likelihood, the toddler will have seen a child lash out at another, or he may even have been on the receiving end himself. Later he has copied the behaviour and he may continue to hit or bite, especially if it has the desired result. It is up to the stay-at-home dad to explain that biting and hitting hurt. Be sure to pay attention to the child on the receiving end first, offering sympathy, before reprimanding the aggressor. Be succinct, as a toddler will switch off if subjected to a long lecture, but repeat the message every time the child lashes out. Getting the message across can be a slow process, so be patient. As the child’s communication skills improve, talk about the problem and encourage the child to express feelings of frustration and annoyance in words rather than actions. Teach the child to share with others and help him understand that a polite request may get him what he wants. It can be tempting for horrified parents to treat biting as a more serious misdemeanour than hitting, but all violence should be treated in the same way. 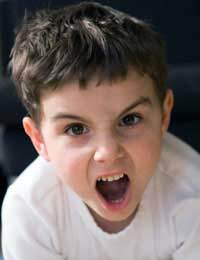 When parents act in an appalled manner when confronting a child who bites, it can prolong the problem. As always, a househusband should set a good example. Don’t smack or shout at the child, as this will only teach the toddler that violence is acceptable. If a toddler uses a toy as a weapon, confiscate the toy and explain why. Tell the child that any toy used in such a way will be taken away. Aggressive behaviour can sometimes be the result of pent-up energy, so try to find another outlet for this energy. Don’t be too quick to jump in and chastise a child either. A lot of children enjoy rough play and often it can be harmless fun, but be alert and ready to act if the behaviour becomes unacceptable. Some parents may want to monitor what their child watches on television and reads in comics. The debate about how children are influenced by violent imagery continues to rage and parents should make their own judgments, but remember that children are prone to copy behaviour that they witness.